Here’s a question – how and where you draw the line between a terminally grumpy person and individual with a genuine anger management issue? Chances are pretty much everybody knows at least one person who is somewhat infamous for flying off the handle for no apparent reason and having a terrifyingly short fuse. Nevertheless, this doesn’t necessarily suggest that they are living with a genuine anger management problem – they may simply be unpleasant! According to the experts at www.davidgoodlad.co.uk, drawing the line is extremely difficult as every instance of an anger management issue will differ significantly from the next. Some individuals believe they have anger problems when in fact they haven’t a thing of the sort, while others believe they are getting along just fine when in reality their anger is controlling every aspect of their life. And of course, actually trying to bring an anger problem to the attention of another person you feel could benefit from professional help is not exactly what you would call an easy job. Nevertheless, it is often important to be the one to bring the subject out in the open, when it comes to friends and family members who may have problems they themselves have yet to acknowledge. So with this in mind, exactly what kinds of signs, symptoms and behaviours can be indicative of a genuine anger management issue? One of the most characteristic signs of an inability to manage anger in a healthy way is when the individual in question have to do something violently physical to release their rage. Examples include punching walls or throwing objects, which clearly illustrate a lack of control. In a similar vein, when an individual is prone to reacting excessively, aggressively or even violently to even the smallest of issues, this could represent an anger management issue. If for example they would fly into a blind range after having a drink spilled on them purely by accident, this could highlight a problem. Another tell-tale sign of an anger management issue is when a person finds it almost impossible to let go of things that had happened previously. Something that made them angry some time ago though has since been resolved still gets their blood boiling every time they think about it, which is probably quite frequently. Though it’s often assumed that those with anger issues take real pleasure in shouting and screaming at others, the reality is in fact quite to the contrary. 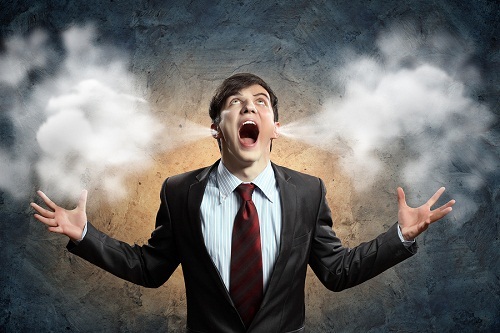 One highly indicative sign of an uncontrollable anger management issue is when an individual almost always feels a sense of guilt, regret or embarrassment after any incident that caused them to vent their anger. This clearly shows that they know their behaviour is problematic and have insufficient control over it. Those with anger management issues always tend to find themselves being the root cause or at least at the centre of every argument that comes up. Not only this, but they seem to find it impossible to go a week or even a day without an angry outburst or incident. When and where the same arguments seem to come up over and over again with the same people, despite having been done to death on many occasions before, this can also be a sign of an anger management issue. In many instances, individuals with anger management issues will also show signs of a wide variety of other psychological health problems. Some will suffer symptoms of depression due to their inability to control their behaviour, others will appear permanently anxious of frustrated while some will come across as somewhat paranoid and constantly believing there are reasons to get angry, when in fact there may not be. Insomnia can also be a characteristic indicator of an anger management issue, as the feelings of anxiety and rage that accompany the problems can make it incredibly difficult to relax and sleep. The most important thing to remember when it comes to anger management is that there is in fact no such thing as a time ‘too early’ to seek advice. It usually takes nothing more than quick consultation with a professional to determine both whether there is a problem to address and how best to go about addressing it. Suffering in silence really isn’t necessary, as regardless of how long you may have been living in the shadow of your anger and rage, there is always much that can be done to help. What are the benefits of making Ayurveda Treatment?